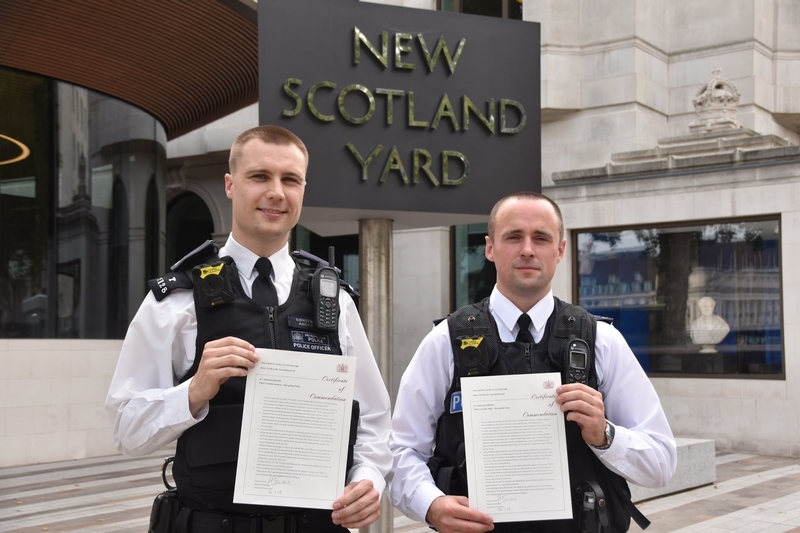 Officers who used a tactical stop to apprehend a criminal on a moped have been commended by a judge. PC George Anckorn and PC Russell Mellis were on patrol when they saw Abdirizak Kheyre, 19, driving a stolen scooter on Hornsey Road junction with Highgate Hill, Islington, north London. They pulled alongside the scooter while it was stationary and asked Kheyre to stop. But he made off soon travelling at almost twice the speed limit. PC Mellis, who was driving the police vehicle, made tactical contact with the scooter, causing Kheyre to fall off. The criminal tried to run away but PC Anckorn chased and detained him. There were no injuries. Kheyre was found in possession of nine bags of cannabis and others containing cocaine and ecstasy. They also found a kitchen knife, approximately 22cm in length, behind the front panel of the moped. Kheyre had a revoked provisional licence and had no vehicle registration in his name. He was later sentenced to 21 months’ detention in a young offender’s institution. Judge Tony Badenoch QC said: “Kheyre placed pedestrians and other road uses at very great risk and had not the slightest concern for them. The pair are part of Operation Venice, the Met’s team which tackles scooter-enabled crime.